Important announcement: An excellent article, Dating of Charatans has been translated for Pipedia by Mathias Acciai. This study by Fabio Ferrara of Monterubbiano - Italy is based on more than 2000 old Charatan pipes he studied from the "Basciano stock" purchased by Mario Lubinski - Fermo. This fantastic addition to the Charatan knowledge base is now in English here on Pipedia. Note: In the United States, Charatan is often miss-pronounced. Rick Newcombe interviewed Ken Barnes and reports, "The pronunciation of CHaratan pipes (not Sheraton) is likely to cause controversy, but the people who knew the Charatans say the matter is not open for debate. As Ken said, "Barry Jones would have gotten his ears boxed if he had called Reuben “Mr. Sheraton.”"
In 1863 Frederick Charatan, a Russian / Jewish immigrant, opened a shop in Mansell Street, located in the borough of Tower Hamlets, London E1, where he began to carve Meerschaum pipes. These pipes got very popular soon, and thus Charatan moved to a bigger workshop in Prescot Street, just around the corner. Here he began to make briar pipes which should make the name famous the world over. 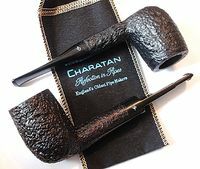 Charatan was the first brand to make entirely hand-made briars from the rough block to the finished pipe including the stems. The nomenclature "Charatan's make" refers to this method of production and was meant to differ Charatan from other brands who "assembled" pipes from pre-drilled bowls and delivered mouthpieces. Being the undisputed No. 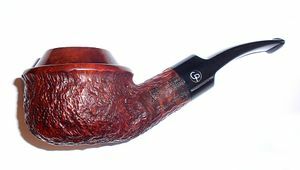 1 in English pipemaking, Charatan was approached by Alfred Dunhill who was unsatisfied with the quality of the pipes he imported from France. During 1908 - 1910 Dunhill bought pipes from Charatan paying exorbitant prices to ensure he had some of the very best pipes for sale in England. In 1910 he lured away Joel Sasieni, one of Charatan's best carvers, and opened his own small pipe workshop on 28 Duke Street. Thanks to Herman G. Lane's dedicated labor Charatan became hugely popular in the States. As reported by Ken Barnes in an interview with Rick Newcombe, Reuben Charatan passed away in 1962, and his widow sold the firm to Herman Lane 1 or 2 years after his death . 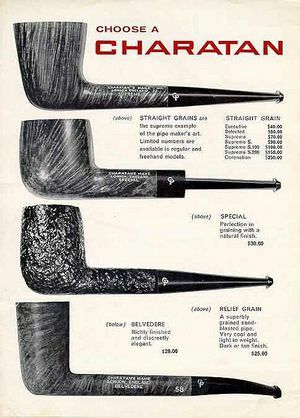 In the early 1960's Charatan pipes were the first to overstep the $100 Dollar line in US pipe sales. In 1978 Lane's heirs sold the Charatan company to Dunhill. The Prescot Street factory was closed in March 1982. Thereafter the fame and quality of the make declined. The pre-Lane period (prior to 1955) and the Lane era pipes (1955 to until sometime between 1979 - 1984) are of primary interest the collector. The Lane era is often quoted as beginning about 1950. 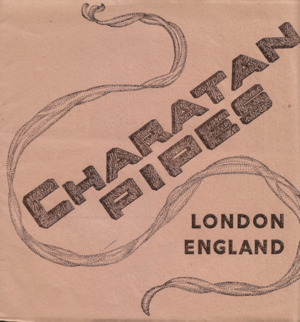 Charatan records are almost non-existent before Lane due to a factory fire, making it difficult to date pre-Lane pipes. Charatan used 4 basic grades prior to 1950: Supreme, Selected, Executive, and Belvedere. After 1950 Herman Lane's influence began, and the grades started to expand. In 1955 Lane took over sole distributorship of Charatan in the US. In 1957 he introduced the Supreme S. Most of his other introductions were from the 60's and early 70's. In 1988 Dunhill sold the rights to the Charatan name, trademark and shape chart - there was hardly more left over to sell - to James B. Russell Inc. (Upper Saddle River, NJ). Russell had made his Charatan pipes in Saint-Claude, France. Butz-Choquin is said to be the manufacturer. Now, Saint-Claude made pipes are surely not bad per axiom, but these Charatans were woefully poor counterfeits of the "real" ones and quite a flop in sale. When J.B. Russell went out of business in 2002 Dunhill re-purchased Charatan and called on Colin Fromm of Invicta Briars and Castleford fame to produce Charatan freehands now. 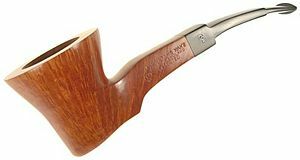 Since Colin Fromm and his foreman Colin Leeson, both belonging to the small number of English pipe artisans skilled in making high-end freehand shapes, had already been making exquisite freehands for Dunhill for a couple of years in Chatham, Kent. To say the least, these Colin Fromm made Dunhill Charatans show impeccable craftsmanship and feature great smoking characteristics at very reasonable prices. Charatan records indicate the DC (Double Comfort) bit was introduced in the 50’s, but some report seeing them in earlier production. Still others indicate they were introduced by Lane in 1960. 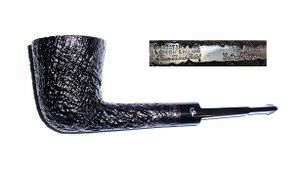 Regardless, the DC bit is not an accurate way to date a pipe because many Charatan’s were made with regular and saddle type bits throughout the “Lane Era”. Notes on Supremes: Supremes made before 1950 were mostly traditional shapes and smaller than after Lane started influencing Charatan. 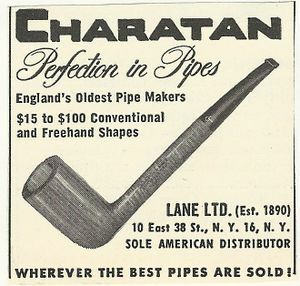 Charatan pipes were not well distributed prior to the Lane Era, so very few pre-Lane pipes exist today. Herman Lane greatly grew the brand in the U.S., which caused corresponding growth in Europe. Generally, block letters “MADE BY HAND” and some of the other nomenclature in script (i.e. City of London or Extra Large next to the MADE BY HAND) means the pipe was made sometime between 1965 and the mid 1970’s. The total script nomenclature “Made by Hand in City of London” evolved over this period of time, so many pipes had variants, such as Made By Hand in block letters and City of London in script, or some other variation of the terms or stampings. It is believed the FH was used on Charatan pipes between 1957 and 1967-68. Three different sizes were used. The Charatan Logo (CP) on the pipe bit was changed over the years. 1. Freehand Relief 4 with Lane stamp. 2. Selected F.H. Lane stamp. 3. Supreme "S" F.H. Lane stamp. 4. Rarity Extra Large, Made by Hand. with me in my motorcycle leathers! 1951 Charatan Catalog, Courtesy of user "alvagram"
I need to point out that there seems to be some confusion around my father's position at Charatans and mine. My father, Kenneth Barnes, was the Managing Director of Charatan Pipes during the 1970s and I (Kennedy Barnes) was learning the trade at Charatans during this time and then formed the Tilshead Pipe Co. Ltd (James Upshall) with Barry Jones in 1978. This page was last edited on 5 January 2019, at 13:10.